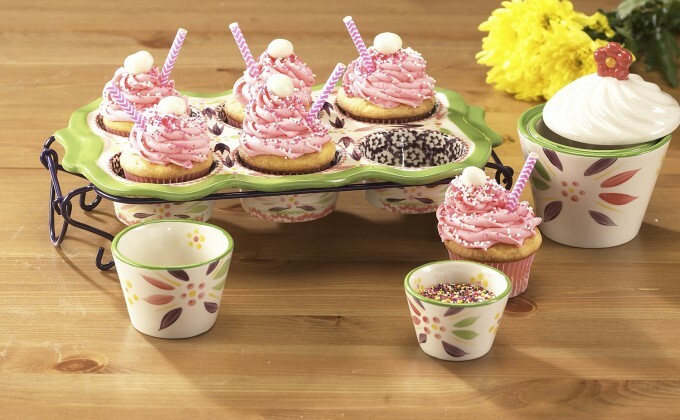 For the cupcakes: Line your temp-tations® muffin pan with paper liners. Set aside. If using one muffin pan you will need to bake these in several batches. Place all ingredients in the bowl of a stand mixer. Blend until smooth. Fill each cupcake liner 2/3 full with batter. Bake for 18 - 22 minutes or until a toothpick inserted into the center of one cupcake comes out clean. Set aside to cool. For the topping: Place all ingredients except the sprinkles, straws and gumballs in the bowl of a stand mixer. Whisk until frosting is stiff, about 3 minutes. Do not overmix. Scoop frosting into the piping bag. Pipe onto each cupcake in a swirl pattern. Top with sprinkles, a decorative straw and one gumball. Place on a temp-tations platter to serve.